The European Network of Election Observation Organizations (ENEMO) is a group of 23 election observer organizations from 18 countries of post-communist countries of the OSCE region supporting and advancing best international democratic observation standards in the region. ENEMO is preparing to deploy an Election Observation Mission (EOM) for the Parliamentary Elections, scheduled for February 24th 2018. Summary of the job: Maintains office operations by receiving and distributing communications; maintaining supplies and equipment; picking-up and delivering items. Participates in staff meetings and external meetings, if needed. Ability to work with people of different cultural and religious backgrounds, different gender and diverse political views, while maintaining impartiality and objectivity. Job summary: Assists the work of the Head and Deputy Head of the Mission, provides translation during high level meetings and press events. Provides translation and assists the Legal Expert and the LTO coordinator in their daily work, and assists in coordinating activities between the Core Team and LTOs. Experience working with national election bodies, international election observation mission or domestic election observation activity. 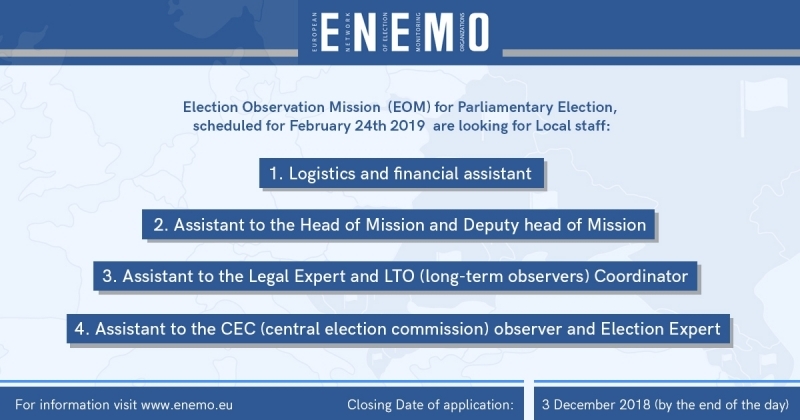 Summary of the job: Provides translation and assists the CEC Observer and the Election Expert in their daily work and activities, assists relations between the EOM and the Central Election Commission.